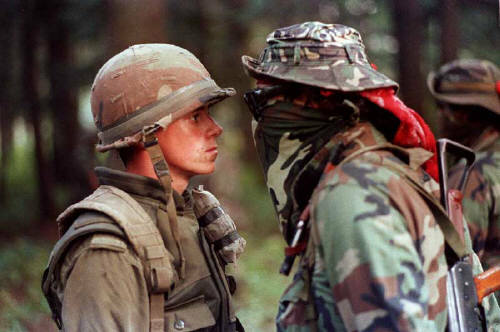 The Oka Crisis was a land dispute between the Mohawk nation and the town of Oka, Quebec which began on July 11, 1990, and lasted until September 26, 1990. It resulted in one direct death, and was the first of a number of well-publicized violent conflicts between First Nations and the Canadian government in the late 20th century. The crisis developed from a dispute between the town of Oka and the Mohawk community of Kanesatake. The Mohawk nation had been pursuing a land claim that included a burial ground and a sacred grove of pine trees near Kanesatake. This brought them into conflict with the town of Oka, which was developing plans to expand a golf course onto the land. The tensions between native and non native people in Canada have been high around communities bordering reserves, mainly for the rightful use of land. Existing prejudices between these two parties would lead to the outbreak of the Oka Crisis. The immediate cause of the crisis was when the mayor of Oka, Jean Ouellette, announced in 1989 that the remainder of the pines would be cleared to expand the members-only golf club course to eighteen holes. Sixty luxury condominiums were also planned to be built in a section of the pines. However, as the Office of Native Claims had rejected the Mohawk claim on the land three years earlier, none of these plans were made in consultation with the Mohawks. As a protest against a court decision which allowed the golf course construction to proceed, some members of the Mohawk community erected a barricade blocking access to the area in question. Mayor Ouellette demanded compliance with the court order, but the protestors refused. Quebec's Minister for Native Affairs John Ciaccia wrote a letter of support for the natives, stating that "these people have seen their lands disappear without having been consulted or compensated, and that, in my opinion, is unfair and unjust, especially over a golf course." On July 11 the mayor asked the Sûreté du Québec (SQ), Quebec's provincial police force, to intervene with the Mohawk protest, claiming that criminal activity had been practised around the barricade. The Mohawk people, in accordance with the Constitution of the Iroquois Confederacy, asked the women, the caretakers of the land and "progenitors of the nation", whether or not the arsenal they had amassed should remain. The women of the Mohawk Nation decided that the weapons should only be used if the SQ fired on the barricade and to use them as defensively as possible. A police emergency response team swiftly attacked the barricade deploying tear gas canisters and flash bang grenades in an attempt to create confusion in the Mohawk ranks. It is unclear whether the police or Mohawks opened fire with gunshots first, but after a 15-minute bullet exchange, the police fell back, abandoning six cruisers and a bulldozer. The police's own tear gas blew back at them. During the firefight, 31-year-old SQ Corporal Marcel Lemay was shot in the face and died a short while later. The situation escalated as the local Mohawks were joined by natives from across Canada and the United States. The natives refused to dismantle their barricade and the Sûreté du Québec established their own blockades to restrict access to Oka and Kanesatake. Other Mohawks at Kahnawake, in solidarity with the Kanesatake Mohawks, blockaded the Mercier Bridge between the Island of Montreal and the South Shore suburbs at the point where it passed through their territory. At the peak of the crisis, the Mercier Bridge and Routes 132, 138 and 207 were all blocked. Enormous traffic jams and frayed tempers resulted as the crisis dragged on. This led a group of Châteauguay residents to start building, without authorization, an unplanned four-lane highway around the Kahnawake reserve. After the crisis, the Quebec government finished the highway, and it is now part of Quebec Autoroute 30. The federal government agreed to spend $5.3 million to purchase the section of the pines where the expansion was to take place, to prevent any further development. This exchange left the Mohawks outraged, as the problems that led to the situation had not been addressed—ownership of the land had simply moved from one level of government to another. Racial hatred occasionally broke through the surface of the crisis as traffic frustration at the blockades grew into anger. The flames were fanned by radio host Gilles Proulx, who repeatedly reminded his listeners that the Mohawks "couldn't even speak French", and the federal Member of Parliament for Chateauguay said that all the natives in Quebec should be shipped off to Labrador "if they wanted their own country so much". When it became apparent that the Sûreté du Québec had lost control of the situation, the Royal Canadian Mounted Police (RCMP) were brought in, but were soon overwhelmed by the Mohawks and mobs created by the blocked traffic. Ten constables were hospitalized on 14 August. Quebec premier Robert Bourassa announced at a press conference on August 8 that he had invoked Section 275 of the National Defence Act to requisition military support in "aid of the civil power", a right available to provincial governments. Prime Minister Brian Mulroney was reluctant to see the federal government, and in particular the army, so involved, but had no choice as it was, under the act, the right of the solicitor general of the province under direction from Bourassa, to requisition the armed forces when required to maintain law and order, a provincial responsibility, as has been frequently done in Canada, including two decades earlier in the October Crisis. The Chief of the Defence Staff, General John de Chastelain accordingly placed Quebec-based troops in support of the provincial authorities. Some 2,500 regular and reserve troops from the 34 and 35 Canadian Brigade Groups and 5 Canadian Mechanized Brigade Group were put on notice and, on the morning of 20 August, a company of the Quebec-based Royal 22e Régiment, the "Van Doos", led by Major Alain Tremblay, took three barricades and arrived at the final blockade leading to the disputed area. The Sûreté du Québec had established a no man's land of one and a half kilometres between themselves and the barricade at the Pines, but the army pushed this to within five metres. Additional troops and mechanized equipment mobilized at staging areas around Montreal while reconnaissance aircraft staged air photo missions over Mohawk territory to gather intelligence. Despite high tensions between military and native forces, no shots were exchanged. On August 29, at the Mercier Bridge blockade, the Mohawks negotiated an end to their protest with Lieutenant Colonel Robin Gagnon, 'Van Doo' commander responsible for monitoring the blockades along the south shore of the St. Lawrence River west of Montreal. This resulted in the resolution of the siege on the Kahnawake reserve. The Mohawks at Oka felt betrayed at the loss of their most effective bargaining chip, for once traffic was flowing again on the Mercier Bridge, the Quebec government rejected all further negotiations. On September 25, the final engagement of the crisis took place when a Mohawk warrior walked around the perimeter with a long stick, setting off the flares the army had set up to warn them of any escapes from the area. The army turned a hose on the man, but the hose lacked enough pressure to disperse a crowd. The Mohawks taunted the soldiers and then started throwing water balloons at them. By September 26, the Mohawks dismantled their guns and threw them in a fire, ceremonially burned tobacco and then walked out of the pines and back to the reserve. Many were detained by the Canadian Forces and arrested by the SQ. The Oka Crisis lasted seventy-eight days and resulted in the death of SQ Corporal Marcel Lemay. The golf-course expansion, which had originally triggered the situation, was cancelled. The Oka Crisis eventually precipitated the development of Canada's First Nations Policing Policy. Jean Ouellette was reelected Mayor of Oka by acclamation in 1991 and said of the crisis that his responsibilities as mayor required him to act as he did.